Description This is the classic route. 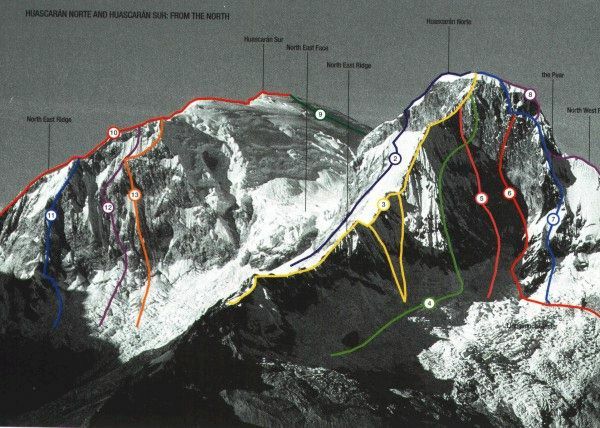 Following a three day approach, the ascent itself is a two day snow/ice climb (up to 50 degrees) directly up the face. Description This is the normal route, the most popular in the Cordillera Blanca. It starts from the village of Musho, and follows a generally well trodden snow path on the mountain's west side. The name Garganta refers to the col that separates Huascaran Sur and Norte, a dangerous area beneath which many climbers have been killed by icefall. Description This route follows much of the normal Garganta route, but detours to climb the west ridge, from which the summit plateau is only a short, steep ice climb away. Description This normal route, starting from the village of Musho, is a straightforward snow climb up the gradually sloping south face and south ridge. Crevasses are possible. 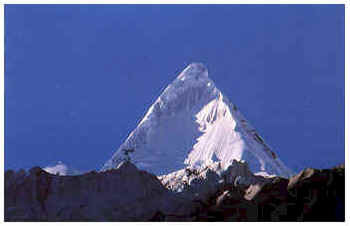 Description Though Huascaran Norte is the smaller sibling of the two towering summits, its north face is a classic wall route. 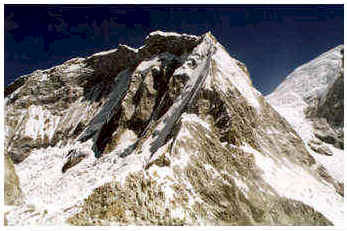 It features steep, exposed climbing on a mixture of ice, snow, and rock, requiring at least a pair of bivouacs. Description This route, which also begins at Musho, features a variety of technical rock and snow challenges on the heavily corniced northwest ridge.